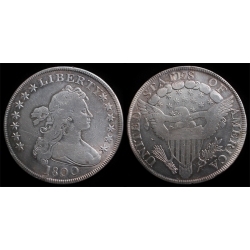 A cleaned coin that is starting to retone. Also a very rare variety with Bowers' Dollar book stating only 30 - 50 pieces thought to exist! Unfortunate that cleaned, but it is what it is. Quite rare but priced along the lines of common -- only $2350.